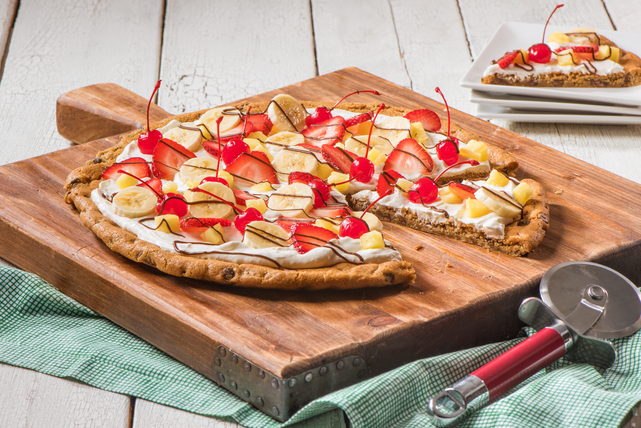 Top a fruit pizza with one of our favorite sundaes with this Banana Split-Fruit Pizza recipe! Try this out at your next party or get-together. Line 12-inch pizza pan with foil; spray with cooking spray. Drop tablespoonfuls of cookie dough into prepared pan; press to completely cover bottom of pan. Bake 12 to 14 min. or until golden brown; cool completely. Beat cream cheese and marshmallow creme until blended; spread onto crust. Top with fruit. Drizzle with chocolate. Since this fun twist on a classic dessert makes 12 servings, it's the perfect treat to serve the crowd at your next party or family gathering. This delicious easy-to-make dessert pizza can be prepared ahead of time. Refrigerate up to 4 hours before serving.